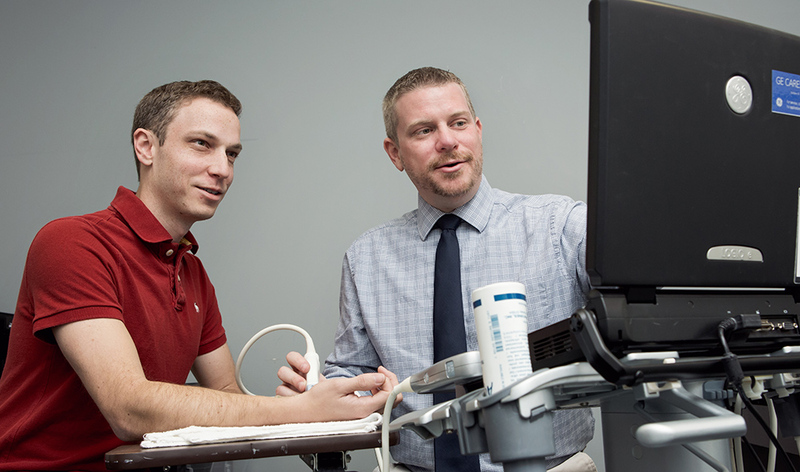 Using sonographic imaging, assistant professor Shawn Roll and his research team seek to detect the earliest signs of carpal tunnel syndrome. This past September, he was awarded a $2.3-million research grant that will allow the researcher to study the early stages of carpal tunnel syndrome (CTS) in dental hygiene students. 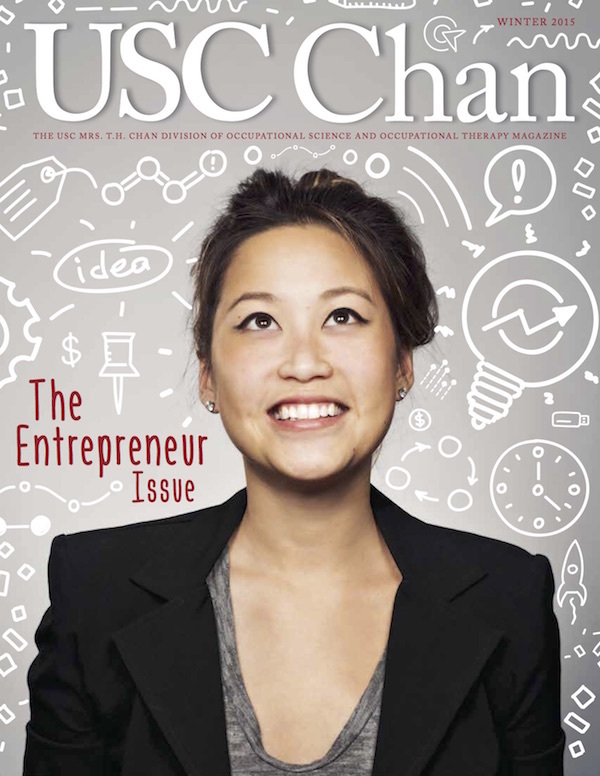 A USC faculty member in his fifth year, Roll focuses primarily on research for the prevention, rehabilitation and assessment of musculoskeletal disorders like CTS. Originally interested in athletic training, Roll changed his focus to occupational therapy, earning a bachelor’s degree in occupational therapy, a master’s degree in allied health professions, and in 2011, a PhD in health and rehabilitation sciences, all from the Ohio State University. Roll refers to adults in the workplace as “industrial athletes” — a nod to his sports background — and treats them as such, working to prevent work-related injuries and helping adults be functional when they do sustain some sort of injury. According to Roll, what is known about CTS is largely from the clinical perspective, when somebody already has identifiable symptoms such as numbness, tingling or weakness in the hand. The four-year grant, which is funded by the Centers for Disease Control, National Institutes for Occupational Safety and Health, is titled “Sonographic Tissue Morphology in Early-Stage Work-Related Median Nerve Pathology.” It will run from September 2015 through September 2019. As principal investigator, Roll and his team will be using sonography to examine populations of dental hygiene students at both USC and Loma Linda University. Among Roll’s collaborators are co-investigator Jane Forrest, professor of clinical dentistry at the Herman Ostrow School of Dentistry of USC, and Wendy Mack, associate professor of preventative medicine at the Keck School of Medicine of USC, who will serve as statistician for the grant. Roll and his collaborators determined that dental hygiene students were an ideal target population for the study. Moreover, Roll describes how CTS in long-term dental hygienists is a known problem. In fact, he cites more than half of dental hygienists report having CTS at some point during their career. In his preliminary work using sonographic imaging on chronic CTS patients, he determined that the median nerve — a major peripheral nerve in the upper limb of humans and other animals — is enlarged when compared to asymptomatic individuals, where the nerve is much smaller. Determining this tipping point could help target interventions and prevent CTS specifically in early-stage individuals. The students in the study will be measured via imaging every four to five months to see if the median nerve tissues are actually changing in size or structure. The team will also use nerve conduction testing to see if the physiology of the nerve is working properly. In addition, the team will collect symptom reports and functional reports from the student populations, comparing the imaging and changes in tissues of individuals complaining of symptoms or problems against those without symptoms. In parallel, the study will collect the same data from a cohort population. “We will collect data from a population of OT students, who also have a two-year professional program and very similar demographics, but do not engage in repetitive upper extremity tasks,” he says. Using the sonographic images collected from both populations, his team will look for changes in median nerve morphology — the first signs of which could indicate the beginning of CTS. At the end of the study, Roll hopes that the research will lead to earlier identification for individuals who might be progressing towards CTS. He stresses that research on the early stages is crucial to prevention. At the same time, the team will video-record the dental hygienists at work and look at the actual positions and postures they are using to be able to understand if there are certain positions and postures that are potentially leading to the symptoms.